← Eat your ugly fruit! Last week, I encouraged you to eat your ugly fruit. This week, I’m going to encourage you to share your best fruit. Anyone who plants numerous fruit trees hits a point in time when it becomes tough to find enough to do with the produce. You can only eat, cook, can, and freeze so much. Our Shiro plum tree produces like crazy. I pruned it hard this year and still have way too many plums. There are many places to donate home-grown fruits and vegetables. Many local food banks take donations. 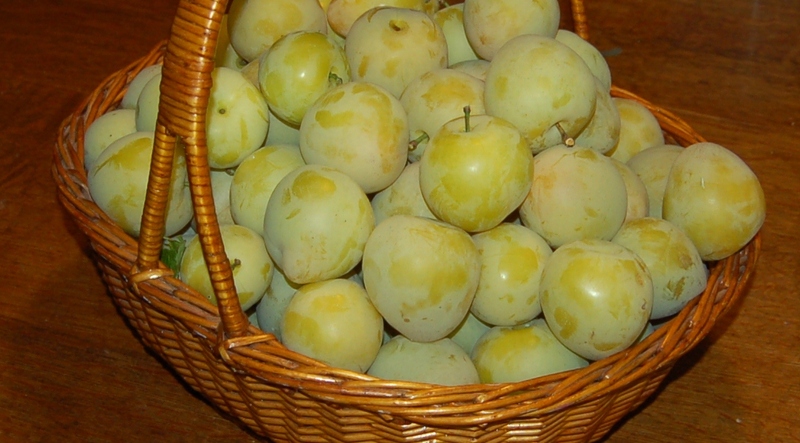 Today, we’re going to drop these plums off at Molbak’s, a local nursery. If you have extra fruits and veggies, I encourage you find a good donation location. It’s way better than letting the fruit rot on the trees. So why donate your best fruit? If you are going to share fruits and veggies with those in need, make sure they look great. Keep the ones with little speckles and bruises for yourself. I picked plums that were just a tiny bit green and perfect looking so that they’ll have a bit longer shelf life and so that those who get them will be so pleased with how nice they look and how great they taste. This entry was posted in Cooking & food preservation, Gardening and tagged food donations, plums. Bookmark the permalink. Makes me wish we had fruit trees because that I know how much this is appreciated by those that are recipients. I am the garden coordinator for the Kingston Farm and Garden Co-op Giving Garden – and all the produce from that very large garden goes to the Sharenet Food Bank in Kingston. We deliver our harvests from Monday and Thursday nights on Tuesday and Friday morning – and there is a welcoming reception every time. Fresh food and vegetables – particularly organically grown – are rather expensive and usually off the menu of those using the foodbank… but with donations such as yours and from others and from places like the Giving Garden, we can do something positive about that. Laura, you’ve mentioned your work with the Giving Garden and I think it’s wonderful. One of my goals is to eventually produce enough excess for more significnt sharing. I think my orchard will be a key part of that plan. Although, one interesting thing was that Molbak’s wouldn’t accept apple donation. I have a lot of perfect apples that will be ready for donation in the next few weeks to month. Any idea why apples wouldn’t be accepted? That is indeed odd if they accept other produce?! Apples are actually easy to store and distribute. Perhaps they had problem with apples being donated from growers that did not spray or use alternative organic methods – and they were riddled with worms as a result? I have been trying to comment on your blog but it’s always late and I have to register or something first (can’t remember what it is now) so I never seem to get it to work.� Just wanted you to know that I always read your posts and enjoy following along! Someday we should meet at Molbaks with kids.� Would be fun! Hello Annette! Sorry you hare having trouble with comments. I’m not sure what the problem could be. I’m glad to hear you are following along! I check out your blog every week as well. It would be fun to meet up sometime.